The British Army has gone on the offensive after being mocked for a new recruitment campaign targeting young people. Its latest attempt to attract young people to a career in the armed forces aims to appeal to them by turning stereotypes about the generation on their head. 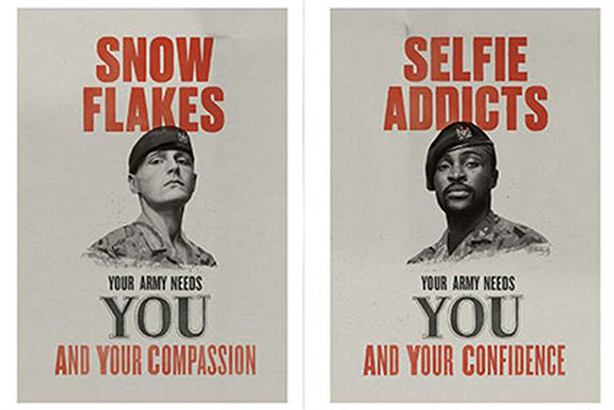 Created by Karmarama, the campaign includes executions in the style of the iconic Lord Kitchener poster from World War I directed at groups including "snowflakes", "binge gamers" and "selfie addicts", while TV ads depict how the same personality types could prove beneficial in the Army. The new approach has received widespread criticism from various quarters. But Lieutenant General Tyrone Urch, commander of the Army Home Command, claims that the posters – using derogatory phrases such as 'snowflake' – were designed to create controversy and have achieved their purpose. Appearing before the Public Accounts Select Committee on Monday, he said: "The recruitment campaign has got nothing to do with those posters, really. The posters are designed to start a debate." The senior officer was giving evidence to the committee's inquiry into Capita's contracts with the Ministry of Defence, including army recruitment. He characterised those he has come across "who don’t like" the posters as either "too old to join the army, have been in the army, are senior people in the army or retired from the army". Lt Gen Urch reiterated the purpose of the posters. "They were genuinely designed to start a debate – thankfully they did just that. So The posters started the debate; the TV ads, which I think are amazing, are genuinely inspirational and really good." The ads, launched earlier this month, have been ridiculed on social media, with critics on Twitter pointing out that the campaign made use of stereotypes that may be held by older people, but are probably not recognised by the target audience itself. Others, meanwhile, objected to the Force carrying out a recruitment campaign, full stop. The response was not universally critical, however: some commentators offered a positive take on the campaign's strategy. I think it's more meant to catch potential recruits eye and suggest that they can be army material despite their pre conceived notions of what a soldier is. All in all I think it's a pretty smart campaign. You can make a soldier out of all sorts of people. And others produced what they considered more apt renditions of the ads. But as Lucy Fisher, defence journalist at The Times, pointed out, the success of a campaign is not necessarily proportionate to its likeability. And the posters have made a major – and immediate – impact in terms of generating interest in joining the army, according to Lt Gen Urch.